Relationship and Genetic Reconstruction DNA test are typically used to determine maternal and paternal lineage, Grandparentage and siblingship. It is most often used when the father of a child is not available for testing. Relationship reconstruction DNA test is also known as genetic reconstruction test. Here, we conduct many DNA tests to compare and match the DNA to establish if a child is related to an alleged father’s relations or not. When the alleged father is not alive or available, his other relatives may be tested to establish a child’s relationship to his or her paternal family. In recent times, many cases of inheritance have been solved with relationship reconstruction even when the actual “alleged” father was not available using the samples from a few of the alleged father’s close relatives ­ who may be his brothers, sisters (full siblings) or a biological parent. Avuncular Relationship Reconstruction Test is conducted to establish whether a child is related to his uncle or aunt ­ who is the sibling of the alleged father. This is helpful in cases where the biological father is not alive, not available or not willing to participate in the DNA testing procedures while the alleged father’s sibling(s) are available and willing to provide their samples. DDC Laboratories India is equipped and capable of delivering definitive and conclusive results even in reconstruction cases were complicated analyses are required. 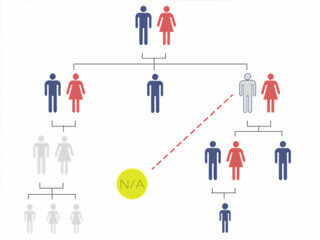 Everyone’s DNA pattern, though unique, carries a major share from their close relatives. With thorough comparison and elimination techniques, we are able to establish relationships and fill the gaps of missing links. Many configurations of reconstruction tests are available; we encourage our patrons and clients to call us for consultation or appointment. Click here for our contact details, collection centers, and working hours.